Gabby and Quack are only two of the many ducks we currently have at the sanctuary. We get ducks that have lost a leg, been hit by a car, been paralyzed, caught in fishing line, left behind by their mother, or their mother has been killed. Spring is the busiest time for us. Last year in just one day, we received 18 mallard ducklings! 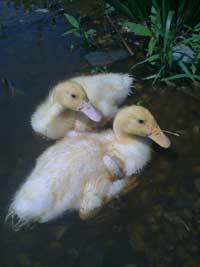 We treat and release the wild ducks and provide permanent shelter or adoption services for the domestic ducks. The ducks contribute back to the sanctuary by laying eggs that we sell locally. They taste so good, people leave notes requesting we regularly reserve some for them! 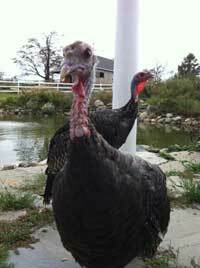 Peepers and Gobble are North American Wild Turkeys. 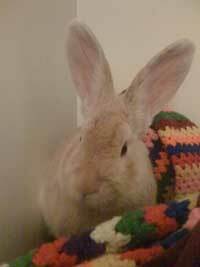 Peepers was abandoned by her mother because she had deformed toes and weak legs and could not keep up. She was found peeping on a golf course by some nice golfers that saved her. She needed several surgeries to walk and although unreleaseable, she is very happy! And a star; she has been featured in several newspaper and magazine articles and is on a website of at least one veterinary clinic. Fortunately, Gobble grew up healthy and was successfully released back into the wild recently. Last year we were able to release almost twenty wild turkeys. Harlan suffered the fate that many rabbits do, when people buy domestic bunnies and ducklings for Easter then quickly realize they grow too big and need too much care. College students also buy them for their dorms thinking it will be fun. Once reality sets in, the rabbits and ducks usually get ‘dumped’ somewhere near a field or pond, but domestic rabbits and ducks are no longer equipped to survive in the wild, and they can likely starve, freeze on those cold spring nights in our area, or get hit by a car. Thankfully, Harlan was found and got a second chance at life. Cleveland and Stewie are very lucky boys indeed. Their mother was found running down a highway in Massachusetts and her rescuers learned that she was going to be sacrificed as part of a cult ritual. It was only after she was saved that it was determined she was pregnant. 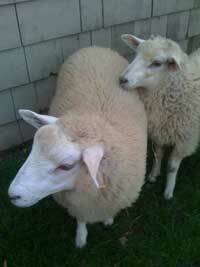 Although their father could not be saved, the mother and her soon-to-be lambs made it through unharmed. They were born at an SPCA and when old enough, made their way to our sanctuary. These sweet little guys don’t even know how lucky they are!